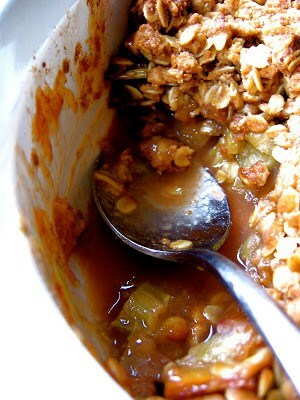 I never would have thought to pair rhubarb with apples, but after trying Deborah Madison’s pandowdy from Local Flavors, I became a stalwart believer. 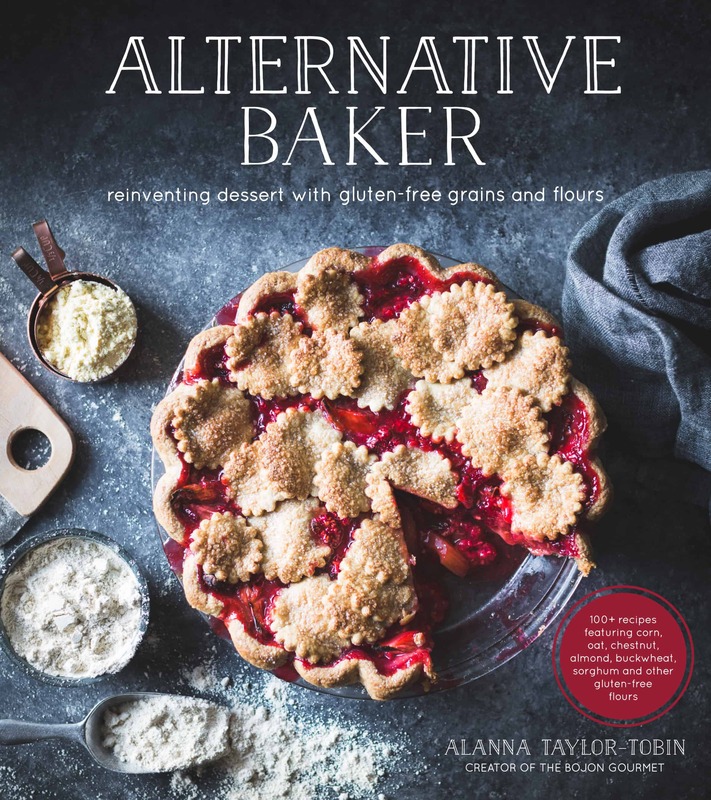 Rhubarb’s tart, fresh flavor is a lovely way to lively up stodgy winter desserts as the weather transitions into spring, and apple tames rhubarb’s tartness the same way that strawberries do. 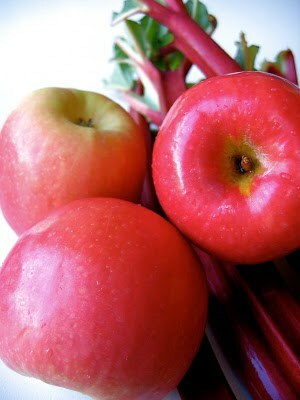 Since apples are less watery than both rhubarb and strawberries, they provide structure that strawberry-rhubarb desserts can lack. 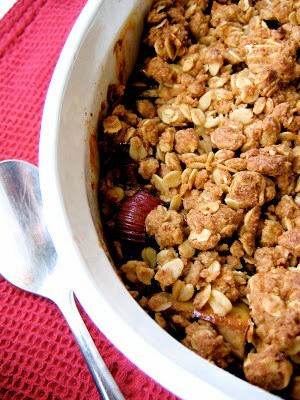 Try this combination in any sort of baked fruit dessert with a silly name: pies, cobblers, crumbles, brown betties, or buckles. If I lived in a cruel, harsh world in which I were forced to choose a favorite dessert, crisp would be it. 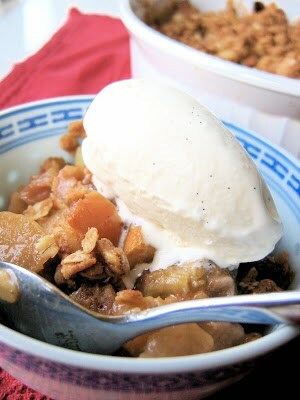 I love the way the warm gooey fruit contrasts with the salty-sweet, buttery topping. A scoop of cool ice cream melting softly rounds out the flavors. 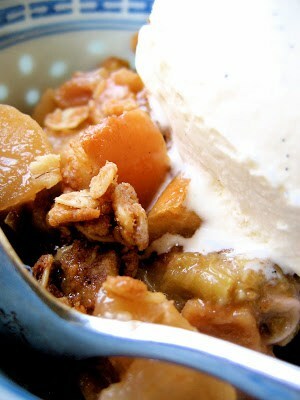 Few desserts come together as quickly and easily as a crisp, but getting the topping just right can prove a challenge. I have tried many crisp toppings over the years and have been surprised to discover my favorite in Mollie Katzen’s The Moosewood Cookbook, a book whose hand-written recipes and charming line drawings are ingrained in my memory since childhood. 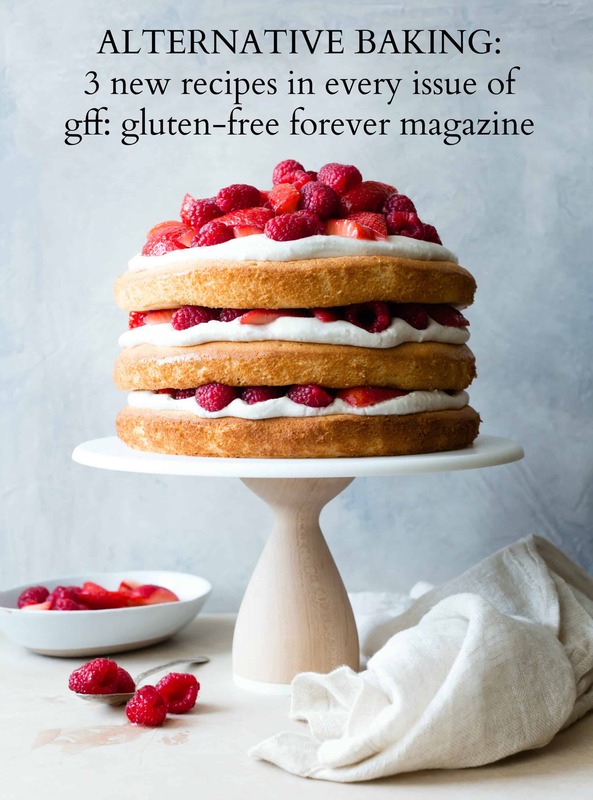 Not just for hippies, these recipes are time-tested and solid, and this one beats out some of the greats, including Lindsey Shere, dessert queen of Chez Panisse, whose crisp I found to be overly buttery and heavy; and those wonderfully OCD folks at Cook’s Illustrated, who have you grind nuts in a food processor, bake the topping separately, then add it to the crisp and bake it again. 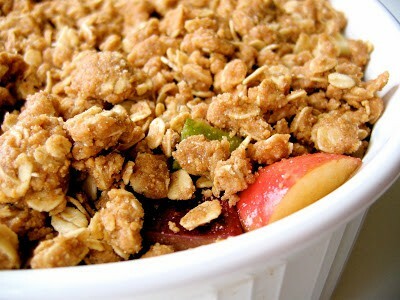 This one gets the ratio of crisp to fruit just right, with a topping that is crunchy and crumbly. The butter is melted, rather than worked in cold as per usual, which saves your finger muscles from having to do a lot of work, and creates perfectly nubby, delicate clumps. I like the high ratio of oats, which lend texture, earthy flavor and healthy things, the low level of sugar (I used maple sugar, but brown or unrefined sugar both work well) and just the right amount of salt. 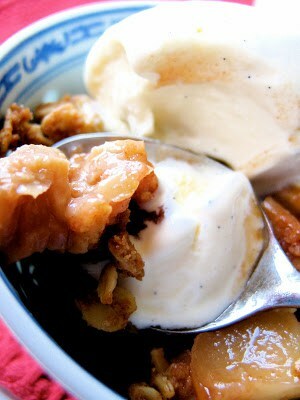 If you like nuts in your crisp, add 1/2 cup chopped pecans or sliced almonds. The filling I pilfered from the aformentioned pandowdy, but subbed a bit of fresh ginger for the spices called for. 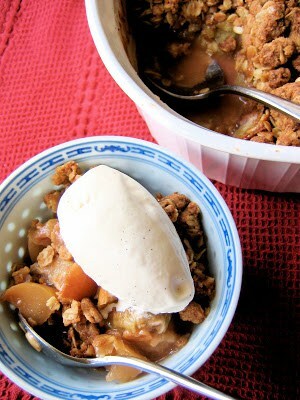 Half a cup of maple syrup gently sweetens the fruit, but if your apples are very tart, add a few tablespoons more. If you cut your apples into smallish chunks rather than slices, the skins are not a problem; they add color and body, and blend right in to the texture of the finished dish. If you prefer to peel them, go right ahead. But please do yourself the favor of having a pint or two of vanilla ice cream on hand for topping the crisp, as you may decide you can’t bear to be without it upon serving. 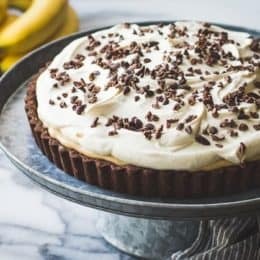 You are going to love this Spring time dessert! Position a rack in the center of the oven and preheat to 375º. If the apple skins are red and pretty, leave them on; or peel them, it's your call. 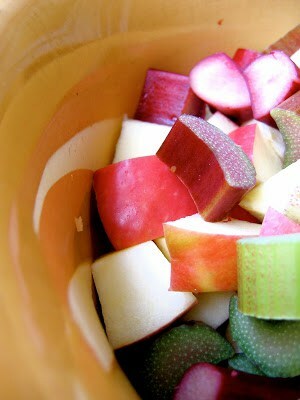 Cut the apples off the core and into 1" chunks. Toss in a very large bowl with the rest of the filling ingredients and scrape into a 9 x 13" casserole, or a gratin dish of equal dimensions. In another large bowl, combine the oats, flour, sugar, cinnamon and salt (and nuts, if using). Stir to combine, then add the melted butter and work with your fingers until it begins to clump into a gravelly texture. Sprinkle over the fruit. Bake in the oven for about an hour, until the crisp in golden brown and the fruit is bubbling up furiously around the sides. Remove and let stand for at least 10 minutes. Serve hot, warm, or at room temperature with scoops (or quenelles) of vanilla ice cream. Store any leftover crisp in the fridge for up to four days; but reheat before serving. 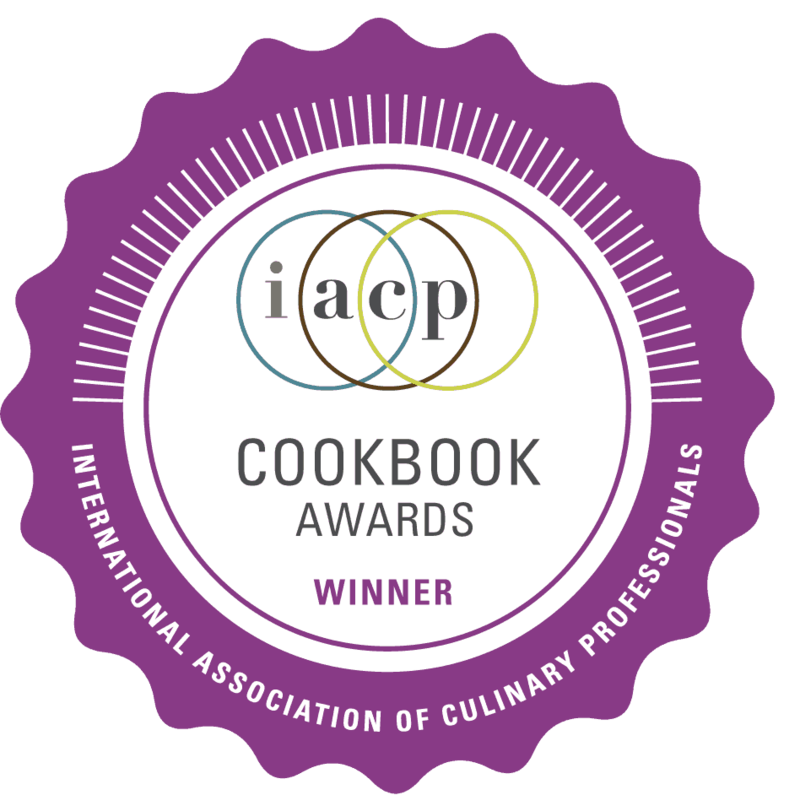 Adapted from Local Flavors and The Moosewood Cookbook. If the apple skins are red and pretty, leave them on; or peel them, it’s your call. 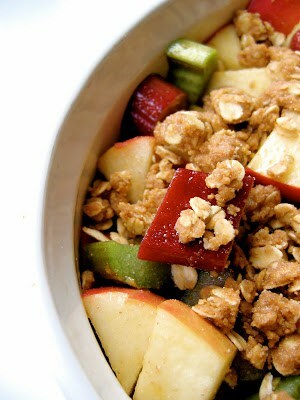 Cut the apples off the core and into 1″ chunks. Toss in a very large bowl with the rest of the filling ingredients and scrape into a 9 x 13″ casserole, or a gratin dish of equal dimensions. Just had an amazing meal cooked for me and a bunch of friends. Despite how many compliments were used up to describe how delicious dinner was, people still had plenty of praise for the crisp that I put together while dinner was cooking. I added plums and wish I hadn't forgotten the nuts. So delicious though, everyone agrees. I am going to make this for an Assoc. Humanistic Psych–Oregon pot-luck meeting for tomorrow. One thing I would suggest: listing the size and shape of the container in which things should be cooked. I have a few rectangular pyrex baking dishes, but they're only about 2 inches high. You show a bowl; was it cooked or just served in that? Sorry, Alanna! I just read the recipe more carefully and see that you do list the kind of baking dish. I should have known that you would be thorough. I've never had rhubarb before but, I've been wanting to try it. This seems like a perfect place to start! That crisp looks amazing! The fact that its healthier makes it even more tempting! Yumm! Thanks! I hope you love it as much as we do! This was really yummy, but I think I'll cut back on the maple syrup next time. I like to taste some of the tartness from the rhubarb! OMG that looks terrific! Our rhubarb will be ready in a couple of weeks. Can’t wait! 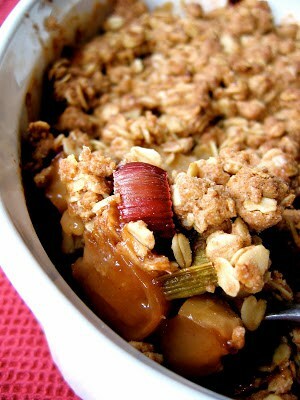 I love your apple rhubarb crisp. I’ve made it many times. I sometimes eat it for breakfast with plain Greek yogurt. 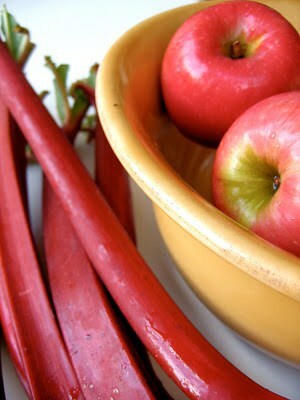 It’s too bad that fresh rhubarb is available only in spring and apples are at their best in fall. I have used frozen rhubarb in fall and non local apples in spring, but I was thinking about trying this today with readily available fresh cranberries instead of frozen rhubarb. Would you recommend any other adjustments for this variation? Or would you recommend against it for any reason? 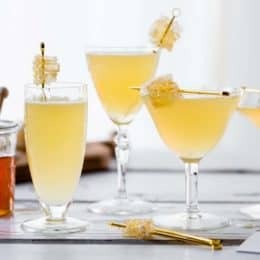 I think this would be great with cranberries! They’re pretty tart, like rhubarb, so I’d imagine that you wouldn’t have to change anything else, but go with your instincts. And please come back and let me know how it comes out! 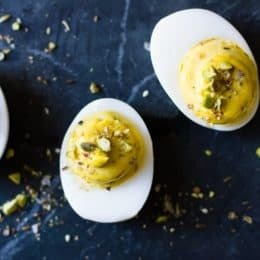 I just made these for a charter, and my guests absolutely raved about it! I think the ginger is a really nice touch. I did however have a dairy allergy so I didn’t use butter on the crumble, I swapped it with equal part coconut oil and it came out perfect! ou! and I used pecans instead of the almonds, it was fantastic. If anyone has a dairy allergy, I would suggest the SOdelicious Vanilla Almond Ice Cream, it was great on top of the crisps. Thanks, will definitely be using again. I made this crisp with rhubarb and apples from our garden. The apples are golden delicious, but a little on the tart side. It is completely delicious! I served it with plain yogurt. Thank you for the recipe.